Because emergencies can happen anytime day or night, it is extremely important to find a 24 hour dog hospital in your area before you need one at a moment's notice. For our patients, as well as any canine requiring emergency dog care in the Lafayette area, Carson Veterinary Clinic is proud to offer a 24 hour veterinary hospital with an emergency dog hospital. If you do not live in Lafayette, then we urge you to seek out and familiarize yourself with the 24 hour dog hospital in your area. 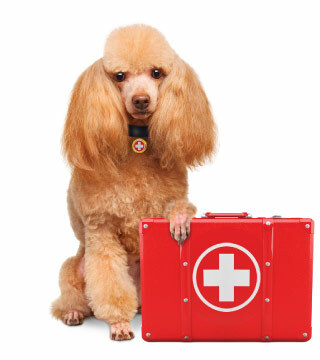 This way, should an emergency arise for your beloved canine companion, you will be prepared to get him or her to an emergency dog clinic immediatelyÑinstead of wasting valuable time that could result in the worsening of an already tragic situation. Proudly serving the Lafayette metropolitan area for over 1982 years, Carson Veterinary Clinic is open 24 hours a day, 7 days a week, 365 days a year for any dog emergency that occurs. Simply call our hospital at 337-806-8960, and our veterinary technician will put you in contact with our doctor on call.